I’ve been having a bit of a brainstorming session today about workshop design and layout (with myself, unfortunately – bit of a one-way conversation), and was lamenting that there isn’t such a person as a workshop design specialist, who can take all the tools and workflows, and come up with an optimum design. What is bugging me, is even with the significantly improved floorspace, I still seem to be lacking a good workshop area – open space, perhaps (at worst) with a workbench in the middle. As much as it is great having machines with plenty of space around them, finally being able to access those machines easily, I haven’t gotten the layout right yet. Unlike some, at least I have access to the collective wisdom of all the readers out there, so let’s brainstorm. Ideas on the table and let’s see if we can’t work this through. In no particular order, here are some of my thoughts. – floor load capacity. Not sure the /m2 load rating – will have to find out. However, working around these limitations, is there any function (other than storage of items not needed on a daily basis) that can be located to the mezzanine? 2. Dust extraction. The dust extraction layout will have to be compromised to work around workshop layout, and not the other way around. However, is having the extractor on the mezzanine a good option. I’m having definite second thoughts. I put it up there to a. free up workshop floorspace b. for it to be inside the main shed, as it draws a lot of air, and if outside the main shed, that is a lot of hot (or cold) air that would be drawn into the workshop, and c. as that would make it generally central to the machines it is drawing from. On the other hand, having it in the timber store next door gives better access, better noise separation, better workshop air quality (particularly on the mezzanine). 3. 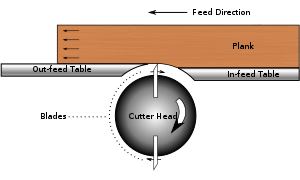 Infeed and outfeed on the jointer and thicknesser. These machines are claiming a lot of the new workshop’s floor space. Both in having area around the machines to walk, but also material workflow area. Is there a better layout? Would there be a benefit in moving one (or both) to the long, narrow timber store? Especially if the dust extractor is going in there. Or is there a better way to manage their floorspace requirements? If it was an option, would replacing the two separate machines with one combo be a better solution? There are some pretty interesting alternate machines out there that could perform both functions in one footprint, and with one infeed and outfeed area. 4. Location of the router table. Would it be better up against a wall (rear edge) as I had it in the previous workshop? Should it swap position with the workbench that is near the lathes? 5. Things I like about the current layout: The lathe area. That back section of the workshop is still looking as I envisaged it. The rest though, really not sure if it is right, and how best to tweak it. 6. Storage. Still a big problem. I have a lot of things still packed in crates, waiting for their new homes to be revealed. Still unsure what a good solution will be. 7. I still really need to move some machines and tools on to new homes, such as the TS10L tablesaw, and the Torque Router Master. The list of machines and tools to move on is also growing. 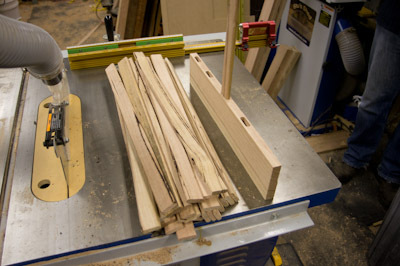 I have a bunch of cheap clamps (quick action, Irwin style, but much cheaper) to go, a scrollsaw, even a radial arm saw. The big ticket items need to go quickly though – need the funds to pay for some of what the workshop has cost, and they take up significant room too. So that is the current list – any thoughts? After taking much of the day to do some family things (beach before, and BBQ after) for Australia Day, I also moved a number of machines into the shed, now that the electrical was completed and therefore the machines wouldn’t get in the way. Heavy buggers, especially over soft, churned up dirt the backyard has become. The pallet jack is such an asset – able to lift the heaviest machine easily, and with reasonably wide wheels, can even manage the ground to a certain extent. Even so, it was too much to move the thicknesser on my own (230 or so kg), so with a brief assistance of a couple of neighbours, it flew across the back yard. Paying the price for it all now though! Never-the-less, a good number of moves was achieved – slowly emptying the garage, and the shed starting to take on real character. Placement/layout is by no means locked in (never is in my shed! ), but am roughly placing them still in accordance with the original plan. What was moved in this time was the Jet lathe (still uncertain about its long term plan), Jet 14″ bandsaw, Torque Workcentre, the workbench, thicknesser. 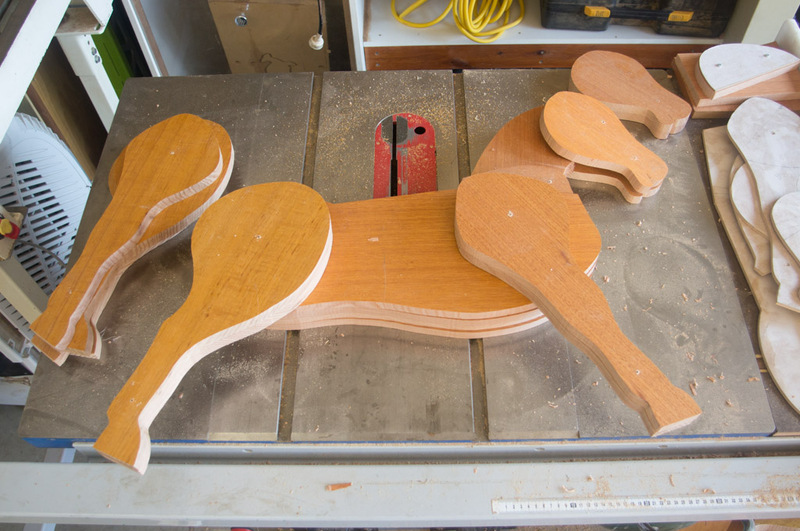 before moving onto what I was actually planning to work on – the start of a rocking horse as recently built by a friend. He kindly gave me his templates and the plans, so I was able to jump straight into it. This was about 90 minutes work with a bandsaw and a template copy bit on the router. Still lots of joining, gluing, shaping and finally finishing to go, but getting to make sawdust and shavings was a palatable relief after so long. One of the first things I went to do was fire up the generator to try out the 15A tools. 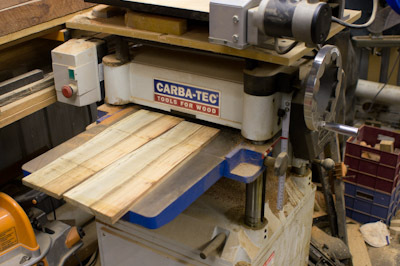 The tablesaw fired up without a problem, but the thicknesser was another story. It kept tripping the generator out. Now I am rather confused by this. The generator is a 6.5KW, so isn’t like it is short of power. Before the move, the thicknesser was working ok, and I subsequently tried (successfully) to turn it by hand (power disconnected, by pulling on the belts). So why could the generator not get it up to speed? It isn’t like the generator wasn’t turning the motor, just extremely slowly under maximum load (with the engine labouring) before the circuit breaker kicked out. The voltage in a circuit is 45 + j10 volts and the impedance is 3 + j4 ohms. What is the current? j represents √-1 (also shown as i in non electrical engineering applications). What it all boils down to, is the thicknesser will just have to wait until the new shed, and the subsequent installation of a power supply. At least the tablesaw is functional again – even if it wasn’t used for the rocking horse (yet). 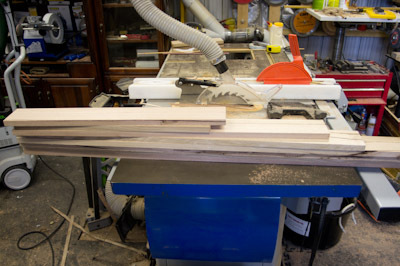 The steps followed so far were all managed on the bandsaw and router table. After reading my article on line shafts, Evan suggested I look at the following video on YouTube. It is an excerpt from a 1981 documentary about a craftsman who is still using a water-powered (and line-shaft enabled) workshop from the 1840s. It is 26 minutes long and does a pretty good job of documenting the creation of a project in this workshop. The video starts with a bit of blacksmithing, which is interesting in its own right, but the majority of the video is about the creation of a large water trough for cattle, completed in a single day using techniques that are very similar to that a cooper would utilise to create a barrel. A very large barrel! What I found fascinating, and really very invigorating and inspiring (used enough adjectives here?) is the machines in this workshop are practically no different from those in mine, and many others around the place. We may utilise electricity rather than water power, but little else has changed. We would be quite comfortable operating in a workshop of the 1840s, and in turn someone from that era would find ours very familiar as well. Our links with our roots are not very long at all. 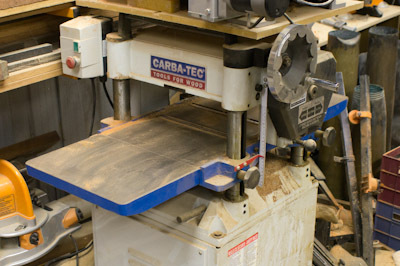 A tablesaw is still very recognisable as a tablesaw, as with the thicknesser, jointer, horizontal borer etc. It seems the only really new technology in our workshops is the router, and even then it is quite possible the spindle moulder dates back far enough to be included in water powered workshops. In 1925 they were still using flat-sided cutters, so that is something we can be grateful has improved over time! (Kickbacks would have been common, and incredibly violent). 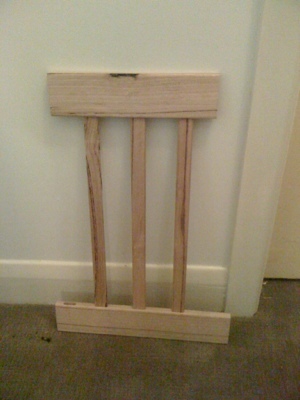 Had a change to take another crack at the cot build this weekend, which was good – more progress. After last weekend, we had the bed itself built (as in the surround and support for the mattress), so today it was time to build the side rails. Oh, and fwiw we are referring regularly to ensure compliance with the Australian Standard for cot design, so the maximum clearance between mattress and bed, height of sides, gap between slats etc etc are all being carefully adhered to. 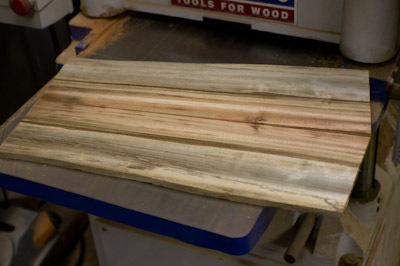 Once again, we started with a large chunk of timber (around 250×45) and began machining it down. A combination of jointer, thicknesser and tablesaw gave us the rails and stiles as the frame for the sides. Despite having them for years, this is about the first time I have actually used the jointer MagSwitch featherboards. They worked very well to ensure even pressure across the jointer cutter. A quick tap down between passes to ensure even pressure is maintained as the board becomes thinner (I do 0.5mm passes on the jointer, so not a real issue in any case). And in case you were wondering, we jointed an edge so we had something straight and true to run up against the tablesaw fence, then ran the board through the tablesaw to get 2 lengths a bit over 90mm wide. 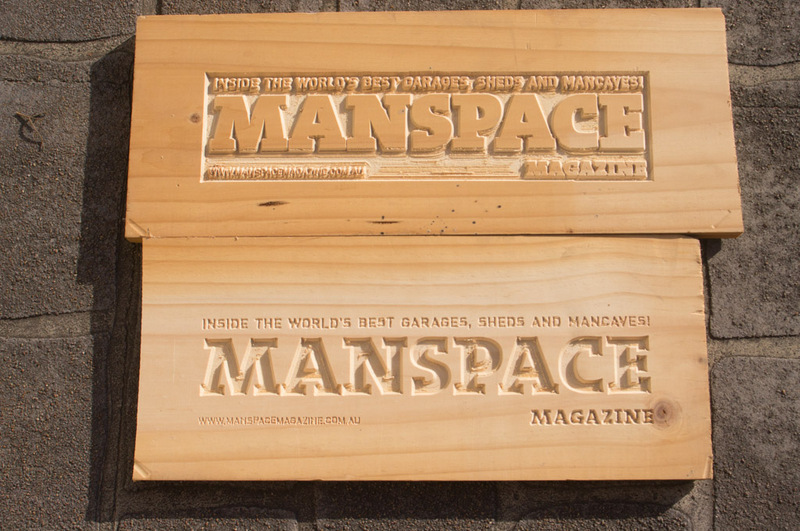 From there, we started machining the boards from scratch, jointing a side, then an edge. Next onto the tablesaw to rip the boards in half, so they ended up 20mm thick after machining. We then spent some time testing and preparing to make the slats for the sides. A number of test pieces, and setups done to fine tune the operation. We started with the Domino – when we need mortices, why not use the best tool for the job?! So with a 10mm cutter, and set to the widest mortice setting, we got a 33mm slot, and thus our slat size was determined. We then made one, and tested it for strength. That went well too. With all setups done, all the spare pieces, offcuts from other pieces of this job were run through the tablesaw to create the number of slats needed, with a number of spares. Each was then tested, bent and abused. A few failed, but the majority were perfect, and will be able to survive even Arnold Schwarzenegger’s kid. Still need to actually create the mortices in the rails, but will do that after some sanding and finishing. To get the required slat placement, the Domino grows wings. It makes cutting the required mortices so incredibly easy, and accurate. Now I know there are two main groups out there – those who cannot understand how any tool can be worth as much as a Domino, and those who love the tool. Unfortunately, I used to belong to the first camp, but since first using the Domino and then more recently (last couple of years) owning one, I cannot help but reside in the second. Awesome machine. Yes, I know – hideously expensive. But very, very cool. One of these days, I’d love to become permanently familiar with the Domino XL too. Another burl found itself being flattened at the hands of the TWC at Ballarat last weekend. This one had quite a curvature, with over 1″ from edge to centre on the cut side. For a thicknesser, this would be a nightmare. For the TWC this was a piece of cake. You may be able to see the separate passes in the photo- this is because at the time of the photo, I was working on maximum material removal (4-5mm per pass, to the full width of the cutter). This means the grain on adjacent passes got cut in the opposite direction to the previous, resulting in a different reflective surface- you can see the passes, but it still feels flat. The final pass is done with very little material removed 0.5mm depth of cut, and maximum 1/2 the cutter width max, so all the grain is pushed in the same direction. Either way, a few passes with the ROS (random orbital sander) removes any minor irregularities. The problem for the thicknesser is both the tortured grain – in all directions so tearout is likely. The cutter direction on a thicknesser makes this even more likely, with the cutter scooping the material up, out of the surface. 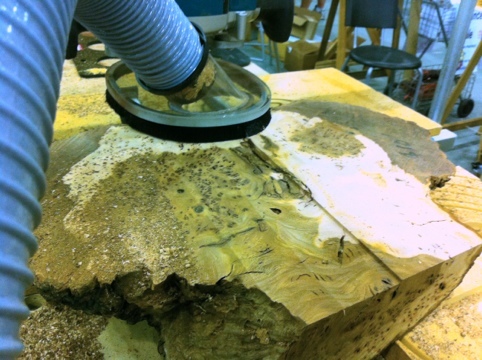 Secondly, stabilising a burl to pass through a thicknesser is also tricky. With drive rollers pushing down before and after the cutter, the chances of the burl shifting and getting a massive kickback from the thicknesser is pretty high. 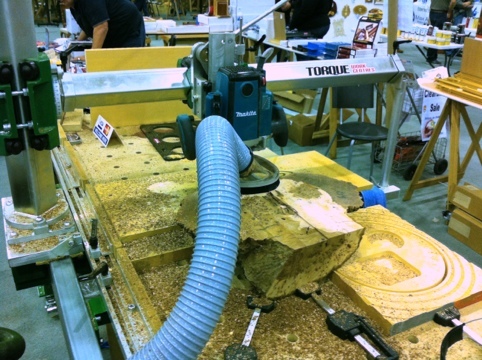 On the Torque, the cutter direction is horizontal, the amount of material removed each pass can be minimal, and is not over the entire burl width simultaneously, and there are no feed rollers to potentially destabilise the burl during the cut. Thicknessers obviously perform a very useful role, but when their idiosyncrasies work against you, the Torque Workcentre takes over! The boards have been resawn on the bandsaw, and had a side and edge dressed on the jointer. Next step is the thicknesser. I have a 15″ thicknesser, with a fixed head and the table rises and falls. I prefer this style of thicknesser, but it isn’t everyone’s cup of tea. The other version has a fixed table, so any additional infeed and outfeed support can remain at the same height, and the motor and blades rise and fall. Winding the height down isn’t a problem – gravity and all that, but increasing the height is a lot more work, especially with the weight of a decently-powered induction motor overhead as well. On the other hand, my thicknesser has a motor in the cabinet, and rise and fall is only the weight of the table – very smooth, very easy. Added bonus, as the head doesn’t move, I have my drum sander located on top, and a very functional arrangement it is, especially as the thicknesser and the drum sander both have the same requirement for infeed and outfeed. 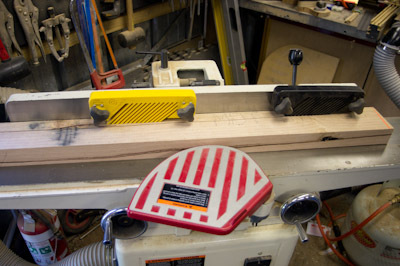 With the side dressed on the jointer face-down, the boards are fed through. There is no point rushing the process – a little taken off each pass will still result in a finished product very quickly. If I had a spiral head, things may be a little different, but I still have a thicknesser head with straight blades, so loading the machine and chipping away needs a little more finessing. This doesn’t refer to the ‘spiral’ heads that have a bunch of the small square cutters arranged in a spiral around the head, but are still presented to the timber straight on. This means the loads on the blades and machine are much less, but they are still chipping at the surface. Instead, there are spiral heads where the small blades each present to the surface at an angle, producing a slicing motion. 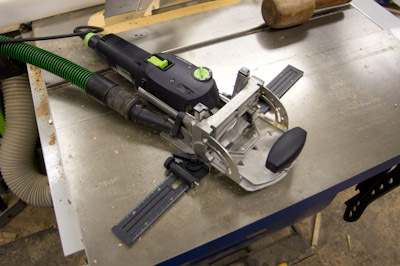 This gives the best finish, combined with the benefit of much lower loads on the tool, and excellent waste clearance. The boards, now complete (and you can see the bookmatching, if I intended to use the timber for that). In this case, I now have a dressed side, the other side also dressed and parallel to the first side (and the boards are a uniform 10mm thick). One edge is also flat, and at 90 degrees to both sides. 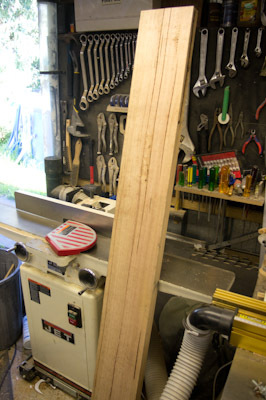 This side will be very relevant for the next step – the tablesaw. From Wikipedia - compare the above operation to this one which is how a jointer works.